What is the biggest flower on earth? It is the Rafflesia arnoldii whose solitary flower can reach a diameter of one meter, and rightly calls herself Queen of the Flowers. This vegetal colossus hides herself so well in the jungles of South Asia that she is rarely spotted. But when you meet her, you might think it is a flower made of foam, so odd she looks. In Europe we have to live with her bonsai version: her nephews/nieces Cytinus ruber. These little flowers do not look at all like the Queen of the Flowers, but they do look odd. They grow in bouquets, the outer flowers female, the inside ones male. 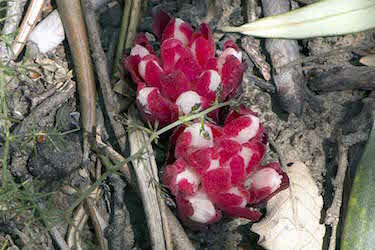 The whole lot looks like a bunch of radish because of the globular forms and the bright pink-red-white colour. Myopic people might think it is a fairytale red mushroom with white dots. They grow under the jungle-like empire of the dark green leaves of the rock flowers. They have more or less married those wrinkle flowers, as I call these merry sunflowers, whose bushes of white and pink coloured flowers cover many hills and mountain slopes on Lesvos. Hidden under the leaves the parasite Cytinus ruberlives on the invisible roots of the rock flowers. Somebody told me that her father always picked those flowers and ate them straight away. They might taste like honey. I haven’t dared do this: they also look a bit like mushrooms and in the mushroom world the colour red means poison. But on the internet you can read that these strange plants without a visible stem or leaves worth mentioning are indeed edible and that locals might serve them as a replacement to asparagus. These days wild asparagus still wave with fat young shoots through the air, preferably in the middle of thorny bushes, where it is impossible to get them without your clothes being torn apart. Greeks usually make an omelet with wild asparagus. If we are to trust the internet, you could also make an omelet with cytinus. It would certainly be a special and colourful dish. The medical world is interested in an extract of these plants to treat dysentery, throat tumors and as an astringent: thanks to the rock flowers, whose roots are the lifeline of the cytinus. Rock flowers do seem to sunbathe all day and appear useless, but their bushes do work hard to make a kind of resin: landanum. As easy as it is to put a cytinus in your mouth as a honey bonbon, it is difficult to harvest this sunflower resin. It’s the flower petals that sweat out drops of the resin, which is best collected at the hottest hour of the day. In ancient times clever farmers had their goats rush through the rock flower bushes, and afterwards they combed the sticky, valuable resin out of their rough coats. In the middle ages this precarious work was done by monks who flailed a leather belt through the flowers. It is mainly the cosmetic industry that still wants this resin to make perfumes, soaps and deodorants. But you will see no more monks beating the bushes, they now harvest the flowers and little twigs and boil them until the resin comes floating on the water. Rock flowers are not monogamous: they also like to pair with mushrooms, plenty of which can be found in their neighborhood in autumn. Another beloved partner is the desert truffle (Terfeziaceae). This descendant from the truffle family does not have a strong taste and costs about a tenth of the price of those so valuable better known truffles. Collecting them will probably not make you rich. But wouldn't it be nice to have a pinch of desert truffle over a cytinus omelet or a honey bonbon? So, we really do have to kneel down on the ground and look for those truffles right under the rock flowers!